I loved Montana. There were scenes like this everywhere — wide open spaces, mountains, horses — beautiful. I passed this place several times and decided I needed to take a picture of it. I waited a little bit for the horses to move into an interesting position (ie not with ALL their backs turned) and took the shot. Simple, but I like it. Processing consisted of cropping and playing around with things in Lightroom. The main effect is the semi-desaturated, “old picture” look. Just down the road from this ranch, I captured this shot of an old, rusty tractor and gave it a similar “old picture” treatment. What a surprise to featured in Freshly Pressed. Thanks, everyone for the kind comments! What I liked about this picture was its simplicity and its portrayal of the vast open spaces — glad you like it too. The picture was taken near Nye, MT in the Stillwater Valley. For those familiar with the area it was approximately half way between the Nye post office and the Stillwater mine. While I’ve driven through other parts of Montana, the Stillwater Valley is the only area where I’ve spent significant time (three different trips). There is basically no tourism which makes it that much more attractive. I’d highly recommend a visit to the forests and wilderness in this area. I’d also recommend renting an ATV (http://www.benbowatvrentals.com/) and heading up into the mountains — AMAZING views to be had. Unfortunately severe rain was threatening (and eventually arrived) when we rented the ATVs so the camera gear stayed in our cabin — no pics. The camera used was a Canon 5D mkii with a Canon 24-70 f/2.8L (at 70mm). The image was cropped slightly for aesthetic reasons which slightly reduces the “vastness” effect but improved the overall image. Over time I’ll try to visit everyone’s blogs, but it may take a while! This entry was posted on August 22, 2011 by michaeltuuk. It was filed under Misc, Photography, Processing, travel and was tagged with 2011, barn, desaturated, field, grass, herd, horse, house, Montana, mountain, nye, ranch, stable, travel, tree. Epic in scale, simple in execution. Well done. Thanks, Mark. That’s what I liked about it — even cropped it still has a sense of scale. So beautiful!! I’ve always wanted to see a Montana ranch and the mountains, too! I love this photo! This is so beautiful! 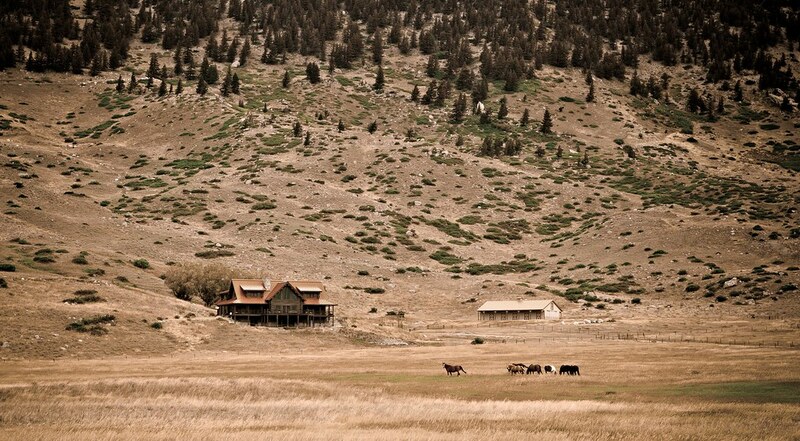 I’ve always wanted to go to Montana, and I’m a horse person… this is basically a shot of my hypothetical dream home. SO lovely. Thank you for posting! Love it. Positively tells the story of how vast MT is! Great photo. I have hitchhiked through Montana many times over the years. Where in Montana was this picture taken? There are a number of beautiful valleys in Montana. Someone told me that he thought that the valley that runs through Ennis, Montana was the most beautiful. I love the country between Helena and Missoula, MT. The bitterroot valley is amazing! (Near Missoula.) I would also say that the area near Flathead Lake is also breath taking. Gosh, that’s where I want to live. You caught it just perfectly. It’s expressive and says so much about peace and nature. This is such a beautiful photo! What a gorgeous place…. I always wanted to go there. Montana is so famous for its beauty:-) Thank you for the inspiration. Beautiful. Like a breath of fresh air. Love how the scenery and what you had to say were minmalist. Spring, Summer, Fall-what about a Winter photo? Next time. Vastness is an understatement. The awesome thing about Montana is that you can see stuff like this just from the highway! However, if you live there like I do and spend time exploring the areas not designated as tourist sights on the map, there is even more beauty to be found that no one even knows about. If you ever come to Montana, I recommend driving through the Swan valley on highway 83 all the way up to Kalispell. The mountains and greenery there are incredible and the area is not that populated or touristy. What makes this picture stand out is the boss mare betraying the fotographer, thus making us viewers feel like we’re in this spectacular scenery being noticed by the horses. You cannot detach yourself from this. Spectacular! Amazing scenery; love how you’ve captured the juxtaposition of the ranch house and the mountain range surrounding it. Thanks for sharing, & congratulations on being Freshly Pressed! I’ve been to many states, but I’ve never been to Montana…and yet, it’s the one state that I’ve always said I think I would be happy to live in if I had to move to America. Your photo proves my thoughts correct – it’s beautiful! I lived in Montana for two years! I loved seeing scenes like this everyday! Life can be simple and beautiful, and I believe that you captured both of those things with this shot. Great photo. I live in Montana… born and raised. Breathtaking in its simplicity and majesty. Love it! If i use one word for image awesome. it’s perfect, just lack of some horse riders, lool. Thank you for taking me back to my time in Montana. I use to live in Bozeman, and I loved that time period in my life. The way you frame your images and the manner you choose to do so is captivating. Thank you again. Wow. Really can’t say much beyond that. I’ve been rendered speechless. SO lovely. Thank you for posting! The camera used was a Canon 5D mkii with a Canon 24-70 f/2.8L (at 70mm). The image was cropped slightly for asthetic reasons which slightly reduces the “vastness” effect but improved the overall image. Love the great expanses of land in Montana!! . . . Your photo really helps to capture the essence of the place! Wonderful photos, very deserving of being Freshly Pressed. I have a similiar shot of a tiny cottage in Ireland that I will have to post on my blog someday when the time is right. Of course I’m not a pro, so calling is “similiar” is hyperbole. I have always wanted to go to Montana, but have never made it. Thanks for sharing what I am missing. I have not visited the West or Montana, however a relative has hunted there many times. Form your excellent photo shot,one gets the sense of the name “BIG SKY” country!! Love the impression of vastness when viewing this scene! And no picture is better than one including HORSES!! This is a beautiful image. Great work. Thanks for a great picture. I agree with Kendall Cotton, those of us fortunate enough to live here find beauty all the time. Most of Montana is not a tourist area and Big Sky is the best name for it. I wasn’t fortunate enough to grow up here, but I’ve lived here long enough to call this place home. I had forgotten how free-ing it is to see the sky out here until I was away for 3 years and came back. There’s just something that opens your soul and sets you free when you’re outside here. No matter what the season or time of day, there’s abundant beauty. Your photo gives the scene a timelessness to it, it could be a modern day photo or one from many years ago. This pic reflects the whole culture of America which I so much love…… truly beautiful..
I’m craving for closer shots of the house. Not that the scenery isn’t drop-dead gorgeous. For some reason I thought Montana would have been really green. Thanks for the wonderful picture. My wife of 40 years comes from Montana and she has tryed to explain how it is. This pic shows me how, thank you. We will get there one day to see first hand. Thank you. I’m glad you like it. It’s funny, while I do like this picture, I’ll say that it doesn’t do justice to how incredible Montana is — you need to visit!